This is a question that’s asked and answered every week on the forums. Actually most of the time people seeking help are directed to this thread titled <a href=”http://forum.daz3d.com/viewtopic.php?t=4031&sid=0079cf261502dd94cd27e235dfbd03d0″ title=”Installation and Content Problems thread on Daz forums”>Installation and Content Problems</a> on the Daz 3D forums. This thread is very long and was started in 2004, though the basic principles remain the same. Still, the fact that people ask this question over and over again is a clear sign that the available quickstart guide and documentation are not quite up to par. However, I don’t really need all that. So, with all that said, I want to go over some situations with the Mac version. I don’t regularly use Windows or Linux so I have no special knowledge of the idiosyncrasies of those versions. Anyway, when you install DazStudio you’ll usually already start with some content, such as the Victoria 4 Quickstart character. The problems begin for most when they buy or otherwise download a new model and they need to get it into the program. Now if that is fine with you, just leave it alone. For me, I wanted my stuff to reside on an external firewire 800 drive, so I created a folder on there. I just named it “content”. You going to need to get to this folder very often so what you do to cut down your number of clicks is simply drag this folder right to the top of your sidebar, as shown, then you can always just select it at install time. 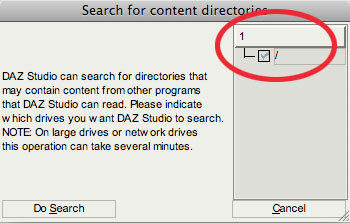 If you changed it, you’ll need to set it up correctly in DazStudio. When you open up Daz, you should choose “DazStudio” from the top left menubar item, and then choose Preferences. In the window that appears, click the Directories tab. I actually removed the default since I didn’t really care to use any of that stuff, but you don’t have to. You can click the “Add…” button and then choose your content folder that you dragged into the sidebar as mentioned earlier. Oh yes, here’s a hint…don’t click the “Advanced…” button on the top right of the window in this screen. You will be unable to escape from this window and you’ll end up force quitting the program to get out of it and get back to work. At least in my version of the program, the “Advanced…” window pops up behind the Preferences window, and yet still has the focus, so you can’t move the Preferences window out of the way or get it to close to get to the Advanced window. A very annoying bug. 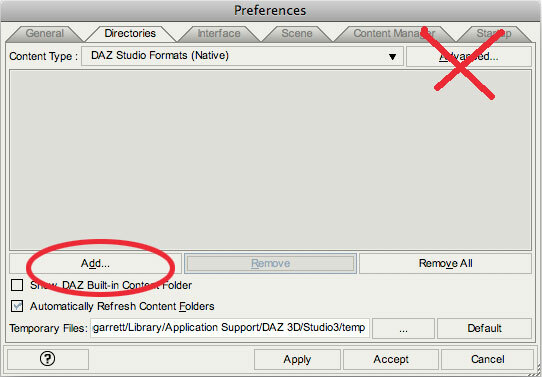 So, once you save the changes (by clicking the “Accept” button) and close out of the Preferences window, you’ll be back in Daz Studio, ready to install content. Now, you’ll need to go to whatever installer you have for the items you plan to install. Sometimes for Mac users the install process can be quite alarming. This is because the installers don’t do a very good job of explaining what it about to happen when you install. The newer installers will simply ask for your content directory. You need only click your content folder in the sidebar and that will be safe. 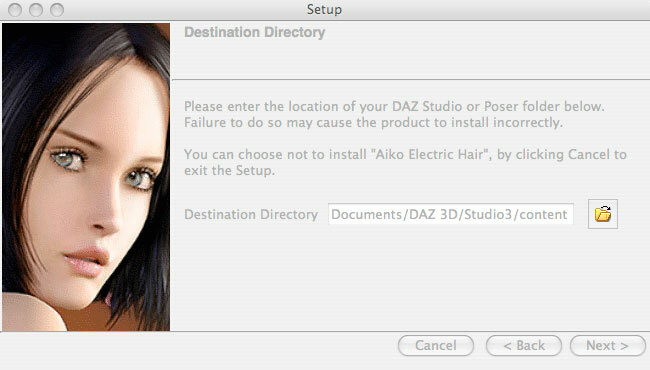 However, many many products still use the older Daz installer. 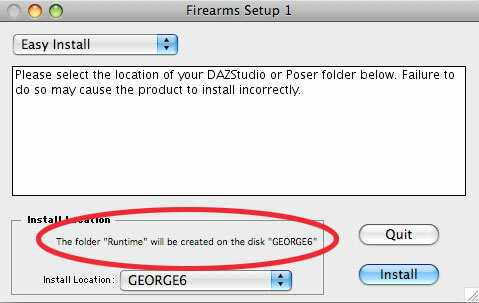 These installers cause mayhem when they report that “The folder “Runtime” will be created on the disk “Computer” (or whatever your computer is named). With these installed you’ll have to choose “Select Folder…” under the dropdown that shows your computer name, and then choose the folder you dragged into the sidebar. So what’s wrong with this picture? Well, every time you install something, it will most likely report that it’s creating a folder called “Runtime” in the content directory. IF this were true, it would erase everything that was there previously! Savvy Mac users see this and that become alarmed, thinking this can’t possibly be correct. Well, it is and it isn’t. What Daz installers do not accurately report is that the items to be installed are not going to erase the current Runtime folder, but instead will be Merged into the existing folder. Merging is a standard feature that Windows and Linux users enjoy. When they drop a folder on top of another folder, the contents are merged together, and nothing (for the most part) is destroyed. This is not a standard feature of the Mac finder. When we drop a folder on top of another folder, the folder being replaced is erased immediately (upon you clicking your acceptance on the warning dialogue box that appears). This is what we expect to happen in this situation. I actually wish it was not the case but apparently Steve Jobs thinks this is better. Anyway, the point is you can safely install “over the top” of your existing Runtime folders without worrying about losing the items you already have there. Now, once you’ve installed the items, you still need to let DazStudio know that the new stuff is there. So, switching back into Daz, click the “Content” tab on the left, making sure that it is the active tab. Now you can click the disclosure triangle at the right of this tab. Choose “Search for Content…” and a new dialogue box will pop up that is titled “Search for content directories”. There’s another gotcha on the Mac version here. The cancel button does not work on this window, so the only way to get it to close is to get to the “Ok” button. that means that when you open this box, you will search for something -which can be easier said than done. If you look at the picture, you’ll see in the right column under the heading “1”, there is a checkbox with a forward slash next to it. That forward slash means that Daz is going to search your entire directorie(s) once you click the “Do Search” button. The text rightly says that this can take a long time. My main drive is 160gb and my Firewire drive is 1 TeraByte. It will take quite awhile if you don’t narrow down the search. The best thing to do here is to first (before opening this window) go to the Preferences window and choose the Directories tab as before. Then click on your listed folder in the window and copy the path to it. Now when you go to the “Search for Content…” window, you can click on that slash and replace it with the path to the actual directory you want searched, cutting down search time dramatically. If you get stuck in the “Search for content directories” window and you need to get out, the best thing to do is to simply uncheck the checkbox, then click “Do Search”. The search will fail immediately since nothing is selected, but you will have quick access to the “OK” button to get out of the window. Another annoying bug that has persisted across several incremental versions of this software despite my and I’m sure other bug reports. Once you get the correct path in there and search, it shouldn’t take long. One good thing is that you don’t have to close and reopen Daz to get access to your items, you can install and keep right on working away. When your items are installed, you now have the next prickly matter of finding the items and organizing the content. Man, I tell you, I still have not re-organized my items into a really solid category structure, so that might be a post for another day. The best thing to do is to keep open the “Read Me’s” that come with most installs. They usually tell you where the item can be loaded from. Generally, you can find most objects by clicking in the “Figures” folder. The materials and optional changes/poses can usually be loaded from the “Poses” folder. Environments/Vehcles and such can most times be found in the “Props” folder, although there are exceptions to all of these. I’ve pretty much got it working for me, but it took a lot of wrangling, epsecially when you are used to more “finished/polished” 2D programs from the Adobe family. DazStudio on the Mac still has issues. The interface is not very Mac-Like. If you’re used to relying on the red dot in the top left corner to tell you if you’ve saved or not then that will be disappointing. Although it will warn you if you try to close a scene without saving. The program generally still resembles a Windows program, not much has been done to integrate it into the Mac more that a coat of paint. The menu/dialogue commands all sport the familiar Windows underlining of keyboard shortcuts, and the program itself closes when you close the window. Very un-Mac-Like behavior. Still, you can get some pretty decent results out of it if you take the time to learn some of the issues. This is only about the very basics, but I’ll be looking to add more posts about this version as I continue. 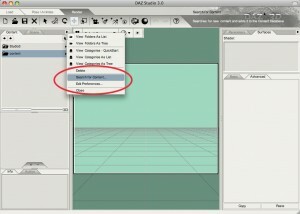 I’ve written some before on using the free 3D program DazStudio 2 on my other site, but now I’ve upgraded to DazStudio 3 and I thought I would write up a guide to how I install items into Daz 3. This is a question that’s asked and answered every week on the forums. Actually most of the time people seeking help are directed to this thread titled Installation and Content Problems on the Daz 3D forums. This thread is very long and was started in 2004, though the basic principles remain the same. Still, the fact that people ask this question over and over again is a clear sign that the available quickstart guide and documentation aren’t quite up to par. However, I don’t really need all that. So, with that said, I want to go over some situations with the Mac version. I don’t regularly use Windows or Linux so I have no special knowledge of the idiosyncrasies of those versions. You’re going to need to get to this folder very often. So what you do to cut down your number of clicks is to simply drag this folder right to the top of your sidebar, as shown, then you can always just select it at install time. Oh yes, here’s a hint…don’t click the “Advanced…” button on the top right of the window in this screen. You’ll be unable to escape from this window and you’ll end up force quitting the program to get out of it and get back to work. Now, you’ll need to go to whatever installer you have for the items you plan to install. Sometimes for Mac users the install process can be quite alarming. This is because the installers don’t do a very good job of explaining what’s about to happen when you install. Well, it is and it isn’t. What Daz installers don’t accurately report is that the items to be installed are not going to erase the current Runtime folder, but instead will be Merged into the existing folder. There’s another gotcha on the Mac version here. The cancel button does not work on this window, so the only way to get it to close is to get to the “Ok” button. that means that when you open this box, you will have to search for something -which can be easier said than done. Generally, you can find most objects by clicking in the “Figures” folder. The materials and optional changes/poses can usually be loaded from the “Poses” folder. Environments/Vehicles and such can most times be found in the “Props” folder, although there are exceptions to all of these. Just wanted to thank you for this write up …. I have been installing and deleting because I am not sure whats going on with Daz. There is a LOT of useful content in the daz directory but then again you have all your stuff in the content folder ??? 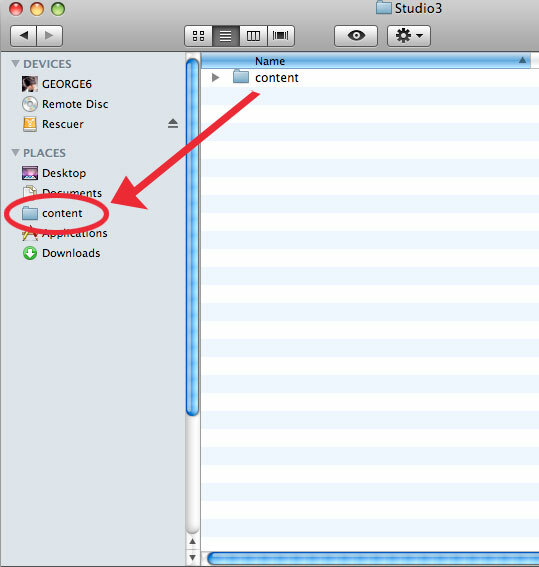 BAM your cont folder is trashed and a fresh ( stock ) content folder is created …. V4 and the rest of the goods will be there. Now would that really be that hard to do ? Great software and I am not ungrateful the least …. but I do say if I was good enough and wanted a pro App …. I would really think twice before dishing out $200 on Daz3d Pro. Yeah man, Daz is pretty powerful for a free tool, but the content management is a huge stumbling block for many. If you read that thread I referenced, you’ll see many a suggestion of how they could make it better. your suggestion would definitely help out, too. I just think that the free version of Daz is a low priority for them, so we won’t be seeing any significant changes to this program soon, if ever. I’m sure getting the new content out is there top priority. That said, I’m still experimenting with Blender and the MakeHuman program. If I can get a reliable rigging script going in the Blender 2.5 Alpha I guarantee I’ll be leaving Daz behind. Glad that there are those out there who can provide us with this information. I would have had no idea of how to do it. This explains it very well and I will let others know. Hey thanks for this. Do you have the installation tutorial for a PC? I’m running off of Windows7. I’m actually fairly ignorant to how the program works on Windows, especially Windows 7. Have you jumped on the Daz forums at all (http://forum.daz3d.com/)? Usually someone might have already asked the question and there’s way more windows users on there than mac users.